Last year Intel criticised AMD for basically gluing together dies to formulate its many-multi-core EPYC processors. Now the firm is nibbling a corner of humble pie with its Cascade Lake Advanced Performance CPUs, announced a little ahead of the Supercomputing 2018 (SC18) conference. 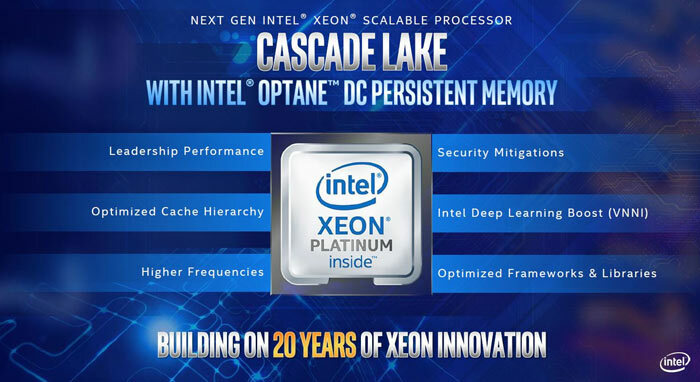 Cascade Lake AP processors pack up to 48 cores per CPU (consisting of a multi-chip package of two 24-core processors) and provide 12 DDR4 memory channels per socket. Intel uses Ultra Path Interconnect (UPI) to connect the dies in a single package. AI/Deep Learning Inference up to 17x images-per-second versus Intel Xeon Platinum processor at launch. However there are lengthy notes of explanation with regard to the tests if you check the small print of the Intel blog and related PDFs. 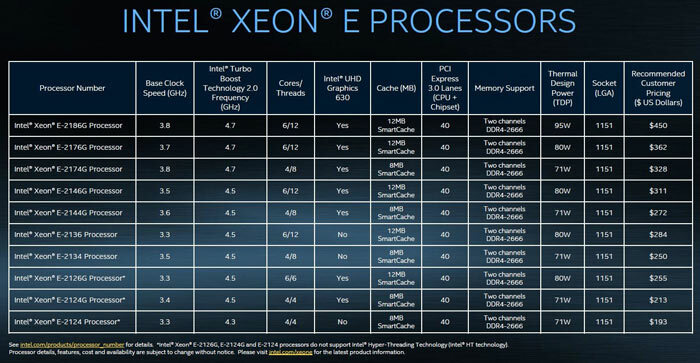 From these notes it is worth highlighting that the AMD chip tested, an EPYC 7601, is a 32C/64T part and that Intel tested it, and systems based upon dual-socket EPYC processors, with SMT off. Furthermore the Linpack binaries, for example, were compiled specifically for Intel. It sounds like it would be best to wait for third party benchmarks and testing, again. Those interested in Cascade Lake AP will have to wait until next year for processors and systems to ship. 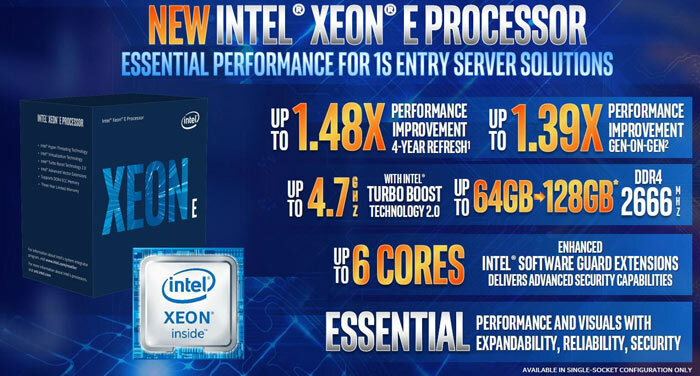 These new entry level server targeted Xeon LGA1151 processors offer between 4C/4T and 6C/12T, up to 12MB of SmartCache, 40 PCI 3.0 lanes, dual channel DDR4-2666 support for up to 128GB REAM, and TDPs ranging from 71 – 95W. New in this updated range are the Intel SGX (Software Guard Extensions) hardware-based security and manageability features. It means that new entry-level servers featuring an Intel Xeon E-2100 processor can provide an additional layer of hardware-enhanced security measures with properly configured cloud applications. 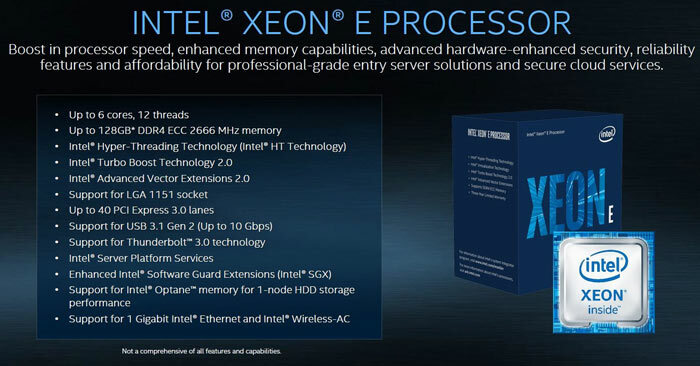 Intel says that the new Xeon E-2100 Processors are available immediately via Intel and its distributors. Anyone else getting sick of Intel treating their customer base for high end parts (i.e. their most knowledgeable and discerning customers) like idiots and trying to con them? Hypothetical: I'm about to drop several hundred thousand on processors for a server room. Or I'm about to spend £2000 on a personal gaming system. Don't worry, Intel, I'll take your word for it and not even bother looking around for the best way to spend money. You just continue to lie to me and have it pointed out by the press. It won't affect my purchasing decision in any way. Comet did something very similar with a mains filter that supposedly made everything better. They had two TVs next to each other, one all washed out and fuzzy and one bright and clear. When I looked into it, they'd changed the settings on the TVs to make one utterly washed out and dim and one fine and bright and sharp and then, after I'd forced him to fix that, the “salesman” (read: con artist) pointed out one was still better than the other. A quick inspection showed one was running on SCART and the other HDMI. Comet went bust a few weeks later. Trying to con your customers is a BAD MOVE. yep, even the pricing on the consumer 9th series are a step in the wrong direction. LOL… rigged ‘benchmarks’ and basically ripping off threadrippers approach to cpu design just shows how shaken Intel are. Interesting that we may see PCIe gen 4 introduced with Rome, maybe that means Zen2 will support it as well. God I'm enjoying AMD kicking Intel in the goolies. Oh the irony. Have they licensed AMD's ‘glue’ then?